Mandala stencils are very popular for today's DIY decor. 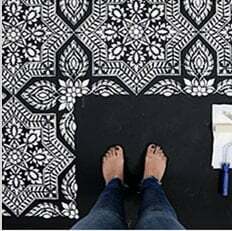 With this beautiful Courage mandala stencil, you can make a bold statement on any wall or floor. We all can use some courage in our lives :) Our large mandala stencils can be stenciled in one or multiple colors to match your decor. Mandala stencils are easy and fast to use despite there seeming intricacy. Perfect choice for a first time stenciling project. For the mandalas that are 18" to 30", you will be receiving a full circle stencil. For the 36" and 44" mandalas, you will receive half of the design. To complete the medallion, tape and stencil the 1st half of the mandala, then pick up the stencil, rotate it 180 degrees and line up the registration marks (see photo above), tape it and stencil it again. For the 60"+ mandalas, you will receive a quarter of the design. To complete the design using a quarter stencil, tape and stencil the 1st quarter. After completing one quarter, rotate the mandala over to complete the half using the registration marks. Rotate and stencil the mandala until you've completed the whole design. Mandala stencils are so easy to use, virtually anyone can do it. Simply tape it to the wall or floor using BLUE painter's tape, then load your foam roller with the paint of your choice (latex or acrylic). Get rid of excess paint by rolling the foam roller over a folded paper towel. Then, just roll it over the stencil applying medium pressure for an instant fabulous result! Don't press on the roller too hard otherwise you might get some paint seepage under the stencil.